This is my first email to you. I have read some of Michael Covel’s books and it has changed my trading entirely; but I still think I’m missing something because my trends have not made up for the whipsaws. I have been trading a very simple moving average crossover on the currency markets for approximately 3 months, but the whipsaws are exceeding the trends. I know it could be that I just haven’t stuck it out long enough, but I’m also not confident that my method will be profitable long term. Thank you for the photos from your ranch. I find it fascinating by a coincidence. On Saturday, [Name] shares a photo of a bear wandering in his backyard. 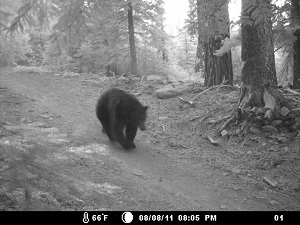 I recall his previous bear sightings around Truckee and wonder if they are a tradeable indicator. He responds, "When I see a bull on the trail I'll let you know." Today your photos show up. I am long gold since shortly after the Reno workshop in 2009. I am very happy with this position. I notice my feelings about it and am able to stay with it through both downs and ups. This is in vivid contrast with my pattern of stopping out of winning trades which I bring to that workshop. I see the last update of the FAQ is from May. I wonder if you have a running tribe now. I would like to attend as a visitor. Watch the Index page for information on upcoming events. Wishing you a wonderful year and more. Thanks for all the sharing and caring. Thanks for acknowledging my birthday greetings. Thanks also for the photos of your new neighbors (cows and horses). They look like a very content bunch! I hope to get a closer and more personal look at them some day. Your neighbors make me remember a time when I was a kid at my uncle’s farm … hard work with livestock! My best wishes for the new adventure, but … is Bastrop really a better place than Tahoe...? Thank you for all, Ed. More cows in Bastrop; more snow in Incline Village. I run a social investing platform that allows ordinary investors to automatically copy successful traders, trade for trade, through their own account. I am firstly making inquiries to discover the best way to get in contact with Ed. I wonder how you get traders to copy how I experience my feelings about trading. Thanks for speaking with me today and thank you for your advice. Attached are screen shots of the traders profile and a sample trading channel profile - its all filled with dummy content but you get the idea. We are close to having our development. To recap how it works - traders setup their own personal profile and when they are ready they create a 'trading channel' and set the fee they want to charge for each subscriber. For example, if the fee is $500 and and there are 100 subscribers the channel generates $50k in revenue which is split with us. We are building technology into the platform to limit the number of subscribers if they don't pass our liquidity test to prevent front running and market manipulation. We also to be an app platform that allows traders to create trading bots. Overall, Roboinvest is about helping people automatically and consistently build wealth over time. This type of product already exists and i think with using technology we can eliminate or at least drastically reduce the risks, and i think it could become particularly useful in emerging markets. I've done preliminary analysis on the most popular traded stocks that appear in social networks (twitter, StockTwits) and the depth is sufficient to allow (generally) millions of dollars of trades at the current offer. I would love to hear any further feedback you have and any suggestions that might improve the product. I look forward to showing you the demo in the coming weeks. Thanks again for taking the time to speak with me. I wonder how you monitor the clients to make sure they take all the trades - without filtering out the "difficult" ones. This link shows people hunting feral hogs in Texas.